The government of Spain outlined its challenge in Strasbourg on Wednesday to an adverse ruling by the European Court of Human Rights in the case of two men from Sub-Saharan African countries who were summarily deported to Morocco after having tried to scale the chain-link border fence around Spain’s North Africa enclave city of Melilla. In October, the European court levied a fine of 10,000 euros against Spain for the August 2014 summary expulsions of the two men, one a national of Mali and the other from the Ivory Coast. 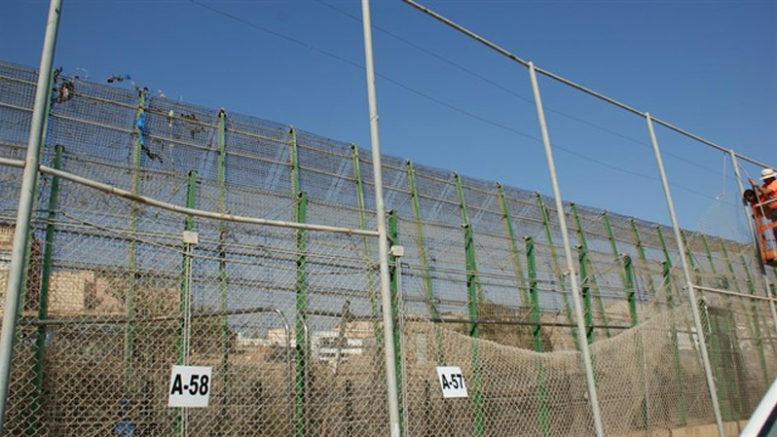 The conservative Partido Popular (PP) administration of former President Mariano Rajoy filed to appeal the ruling on the basis that the men were economic migrants and not asylum seekers, citing as evidence their attempt at illegal entry to Melilla by scaling the three-metres-high chain-link fence separating the coastal city from Morocco. The Spanish government’s policy had been sharply criticized by human rights groups, which said that summary expulsion of individuals seeking access to Europe via Spanish territory without granting them a hearing and an opportunity to apply for asylum was in violation of Spain’s European and international treaty obligations. Though Spain’s Socialist party (PSOE) had gone on record while it was out of government as being opposed to such expulsions, since taking office in June the new Socialist administration of President Pedro Sánchez has had to contend with a massive increase in the number of economic migrants and asylum seekers seeking refuge in Europe via Morocco. According to reports, the migrants are being trafficked by mafias who have shifted their human smuggling route away from Libya and the Eastern Mediterranean and are transporting the migrants through Morocco to reach Europe via Spain. In late-July, more than 600 mostly Sub-Saharan African migrants stormed and vaulted the chain link fence at the north African enclave of Ceuta, reportedly hurling stones and quick lime at border guards and injuring 26 in the process. The Sánchez government subsequently invoked an accord with Morocco and when a mass entry was again staged in Ceuta in August, the government immediately expelled 116 of the migrants involved. On Wednesday in Strasbourg, however, a government attorney told the European court that the majority of the migrants are being transported and encouraged to storm the fences at Melilla and Ceuta by human trafficking rings that earn an estimated 1 billion euros each year from smuggling the migrants through Morocco. The government attorney called on the court to come up with what he called a “balanced” ruling in the 2014 case, saying that to simply condemn Spain for expelling migrants with apparent economic motives who are being trafficked for profit “could fuel illegal activities to the sole benefit of the mafias” and also have the unintended consequence of risking the safety and undermining the rights of the migrants themselves.